Why is my Dog Lunging on the Leash? Do you own a dog that does not act “normal” when he sees another dog on leash? 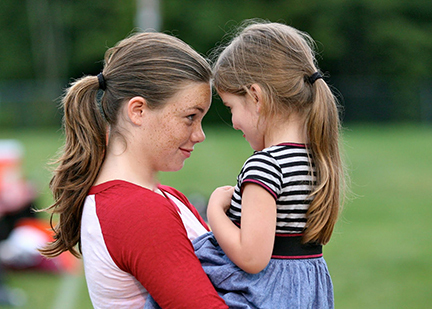 Learning good emotional control takes practice. Many dogs do not have good coping skills to greet another dog when confined by a leash. You may describe this type of dog as fearful, hyper vigilant, aggressive, reactive, out of control, barks all the time, rude, pushy, anxious or even clingy. Dogs who exhibit these behaviors are cruelly labeled and often given up on, but the truth is that these behaviors are your dog’s way of begging for some help. If your dog is displaying these emotions he is clearly not a calm dog, and therefore not a balanced or content dog. Unbalanced dogs are riddled with emotions they cannot control, which make them difficult to live with and own, but these are the dogs that need us the most…..
With effective behavior modification programs, these anxious reactive dogs can thrive in our homes and communities. Having a plan to keep them safe, predictable exercise routines, desensitization tools, healthy nutrition, doggie Zen and possibly medication, these dogs will love us unconditionally. Just look in there eyes and help them feel safe, always.. If you have taken on the task to raise a dog with fearful reactive behaviors, know you are not alone. I personally have three dogs who each have different levels of fears and often use distance cues with humans and dogs. I understand your stress of owning an unbalanced dog…. Even my family members have called them names, not truly understanding my dogs level of stress. I feel an enormous amount of empathy for these animals as I see in their body language how much more worried they are then other dogs. I have spent hours counter condition their fears to various stimuli and I work very hard to have a plan each time I take them in public so I can set them up for success. I manage for safety, continually counter condition their fear emotions to positive ones so they know what to do in different situations and cherish each calm moment we have together. My two females came to me with bite histories and have each received their Canine Good Citizen Certification from two different trainers. One has gone on to be Therapy Dog International Certified, so do not lose hope and celebrate each small daily success! Using the right balance of tools, your dog will one day be able to think through his arousal so you can reward him and not be frustrated with him. 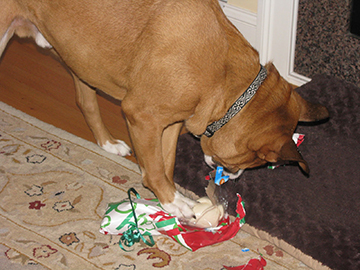 Protect your dog from becoming aggressive by knowing where he is and who his playmates are. The topic of leash aggression arises so often, I feel the need to address it often in my blogs. 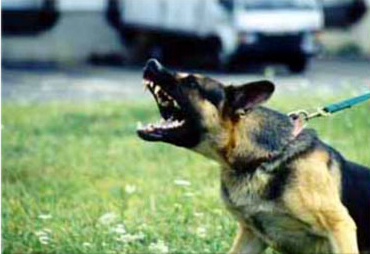 For dog trainers it is very clear why we do not let our dogs greet unknown dogs while on leash. I want my dogs attention on me when I have him on a leash. I prefer he not pull my shoulder off when on leash, so I never let him greet other dogs when on leash and guess what? He does not ask anymore because he knows the rule structure. 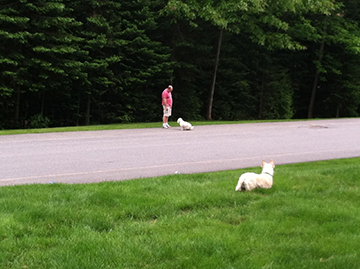 In my opinion, the BEST reason to avoid letting your dog greet unknown dogs while on leash is to keep him or her safe. Once your dog gets into a scuffle while on leash, just the site of a dog while on leash can become very scary for your pup. Tight leash is nearly unavoidable. We have all seen or heard stories of two dogs greeting on leash and it ends badly. Let’s think about it, when dogs greet off-leash they are able to circle, sniff and have the freedom to move away if one dog becomes stiff, defensive or worried. When on-leash we often tighten the leash, which makes the dog feel trapped because it cannot flee the environment. 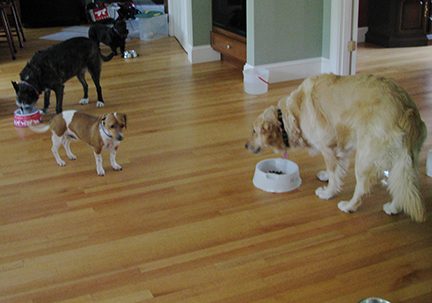 As a result, the constrained dog may send the other dog a distance cue like a hard eyed stare, a lip curl or a low growl. Depending on the social skills of the other dog, this may turn into an unwanted scuffle. If you want your dog to have good social skills and avoid aggression, let him have an opportunity to socialize and play with other GOOD dogs. Start with an AKC STAR Puppy class, teach your dog leash manners throughout his adolescence and set up off-leash playdates with dog-friendly dogs that you know he enjoys playing with and who have owners that you are comfortable with. A large part of my business is helping dog owners understand why their dog is jumping and snarling when on a leash in the presence of another dog. This behavior is done by your dog for a variety of reasons. He may have learned that it keeps him/her safe. Dogs that have been traumatized by another dog, or multiple dogs, learn that their best defense is a good offense. If this behavior works for them, why would they need to change? Being safe simply feels good. 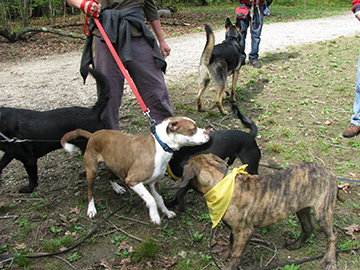 Social dogs can relax in the presence of other dogs even while being on a leash. I do understand your dog needs daily exercise to get him through his adolescence. If your dog plays well with the neighbors dog, then your dog is already social! Walking on-leash together is a great way to learn leash manners around other dogs. Or, hire a dog-walker who only brings one dog to your session and watch how your dog interacts with that dog. 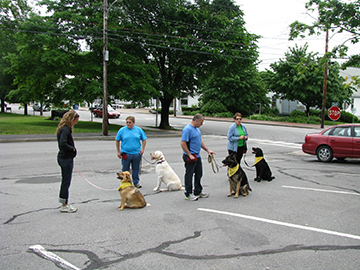 Your dog-walker will help him learn leash manners and prevent any unwanted behaviors from being reinforced. Many dogs are surrendered because they can no longer cope with being on a leash in society. Who’s to blame? These dogs were not born dog-aggressive. Rather, it is learned by putting them in environments that are out of control and scary. So please know who your dog is playing with, and if the play is appropriate. We can all agree that aggression breeds more aggression, so please know who your dog’s friends are! 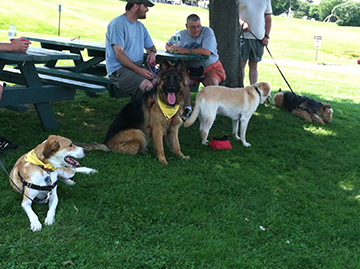 In the photo to the right, my Outdoor Adventure Class is open to dog friendly dogs. Dogs that have good emotional control, dogs that can sit and watch a dog go by without demanding to get to it, and dogs that are not overly pushy. If your dog is demanding to say “hello” to every dog that goes by, think about why that behavior is developing and where it is being reinforced. I hope to see you and your dog in a training class, while on-leash and enjoying each other’s calm company!